Set in contemporary Chicago, four women with nothing in common except a debt left behind by their husbands' criminal activities, take fate into their own hands. 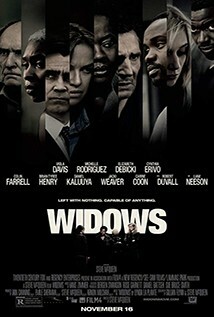 We follow the four women (Viola Davis, Michelle Rodriguez, Elizabeth Debicki. Cynthia Erivo) who just lost their husbands – men who, it is revealed in a thrilling opening sequence, were thieves who stole from those even worse than themselves. To repay this debt, the women – plus an outsider, who comes in after a very sly third-act twist – must pool their resources and finish the job their husbands couldn't. Steve McQueen (12 Years a Slave) helms this heist film masked on top of a treasure trove of ideas about class, race, history and who has the power to rise above their station. The film was chosen to open the recent London Film Festival.